"I do not think there is anything that would lead one to believe that this vessel (M/S AL SALAM BOCCACCIO 98) was in any other than perfectly acceptable condition." The M/S AL SALAM BOCCACCIO 98, was a Panama registered ropax vessel, which sank on 3 February, 2006, at approximately 01.33 hours Egypt local time (23.33 hours UTC on February 02, 2006), during a journey across the Red Sea, a short international voyage, where she departed from the Port of Duba, Saudi Arabia, with destination to Safaga, Egypt. It was suggested that (i) a fire broke out in the main RO-RO cargo space - garage - in the ship's superstructure (car deck), that (ii) water of the spray fire extinguishing system used to extinguish the fire could not escape, as (iii) the scuppers were blocked and that (iv) the weight of this water caused the vessel to capsize and sink and (v) that >1 000 persons drowned. The International Maritime Organization, IMO, has described the incident at its web page. IMO does not mention that the Egyptian president of El Salam Maritime Transport Co, manager and owner of the vessel, was later sentenced to seven years in prison in connection with the incident or that at no time during the incidient the ship contacted the office at Cairo by radio. The M/S AL SALAM BOCCACCIO 98 was a very robust and safe, Italian built ropax vessel and operated by a very professional ship owner at Cairo, as shown below in Figure 1 (from report). I, since 1980, assisted personally the ship owner, MI, when we inspected and bought the ropax ferry at Palermo, Italy, and its four sister ships in the 1990's. The Italian Sellers were very happy to sell their very good ships and we were very happy to buy them for service in the Red Sea and Mediterranean. The links above do not work 5 February 2019! It seems particular interests do not like further interest into the crime. So you have to Google for more info. 1. Accommodation deck house with passenger cabins as part of the original construction and fitted with sprinklers as per SOLAS 60. There are also open decks there for life boat and life raft embarkation. 2. Machinery spaces in ship's hull below the bulkhead deck fitted with CO² in the M/E, auxiliary engine, stabilizer room, and electrical installation. 3. Main RO-RO cargo space - garage - in ship's superstructure (car deck) fitted with water spray fire extinguishing system. It is accessed via a ramp aft. 4. Deck house with open decks, passenger cabins and public rooms added to the vessel in 1990 and 1991 duly calculated and fitted with sprinkler system. On top is the wheel house with the VDR. 5. Upper Ro-Ro deck in superstructure replaced with passenger and crew cabins and fitted with sprinkler system. 7. Sponsons (double hull) fitted on each side of the hull in 1990 and 1991 to add buoyancy and stability to permit 4. The vessel floated on its watertight hull at max draught 5.9 meters on top of which was the bulkhead deck and an about 6 meters high weathertight superstructure with a ramp door aft and pilot doors in the side. The free board was 1.312 meter. The bulkhead deck was fitted with 13 scuppers port and starboard to allow water used to fight fires inside the superstructure to escape (flow out) by gravity. On top of the superstructure was a non watertight deck house with the wheel house + VDR. "(Vessel) sailed from the Port of Duba at 1651 hours UTC, and reported a draught of 5.7 meters". "The M/S AL SALAM BOCCACCIO 98 was fitted with 13 scuppers on each side of the (bulkhead deck of the) ship, and each scupper had a diameter of 125 mm. The scuppers were fixed with two non-return valves, one high up and the other at the lower part of the scupper, near to where it discharged, below sea level. The scuppers had a design capacity to evacuate the water coming from the fire-fighting system. It is important to underline that immediately after the accident, several inspections and evaluations were carried out on the sister ships in order to obtain a similar view of the drainage system, but especially regarding the stability, fire-fighting systems, and behavior of the crew, as well as the scuppers performance." (Note: A bulkhead deck scupper could easily evacuate 66-76 m3/hour, so 13 scuppers on one side could evacuate at least 858 m3/hour or 6 scuppers port and starboard aft could evacuate at least 396 m3/hour). "The vessel was fitted in the (superstructure) car deck, with a fixed fire extinguishing system (water spray type) reach to protect 5 distinct zones, with the capability of delivering 430 m³/h through the nozzles. Each section can be manually operated independently from the two different control stations." (Note: This 430 m3/h water spray system was regularly tested in port and all water just escaped through the scuppers as expected without ship heeling or listing. Of course a test was normally just 15 minutes ... ). I have attended the tests many times. I have never seen any garbage on the deck that could block the scuppers. And if the garbage was light, it would float on the water and could not block a scupper. What heavier than water garbage that blocked the scuppers is not known. ... "The VDR capsule was found at the following position: 27º 08.0' N, 034º 59.1' E. Around 97 percent of the data was recovered by the technician of Broadgate, and was very useful in clarifying most of the aspects of the investigation". At the time of the recovery of the VDR, the wreck was found at a depth of 912 meters lying on her starboard side. The ROV carried out a survey, where we were able to observe that the aft ramp of the vessel was still closed. ... "At 1909 hours the fire alarm of the M/S AL SALAM BOCCACCIO 98 had activated giving a visual and audible alert signal on the control panel at the bridge." (Note: So 2 hrs 20 minutes after departure about 40 nautical miles from shore a fire was observed on the car deck in the superstructure. It was not the first time such incident occurred. The crew started to fight this local fire using the fixed fire spray water extinguishing system. It was very good! You just use the sections of the fixed system above the fire and normally the fire is extinguised after a few minutes. Only 3 of 5 sections were used so input was 60% or 260 m3/h. It should easily escape through the scuppers. As far as I recall the fire figthing team of the car deck (and deck house) consisted of a deck officer and seamen from the deck department.). ... "By 1921 hours, there was still uncertainty by the bridge team, as to whether the fixed fire-fighting extinguisher system was actually in operation, due to the lack of communication with the E/R. The crew could not identify the source of the fire due to the thick smoke in the car deck." ... "At 2231 hours the 3/O informed that there was nobody responding in the E/R." "At 2307 hours, the list continued at 15 degrees to starboard and the master ordered to ballast down more tanks, due to fact that he thought that the capacity of tank number 25 on the port side was very small." ... "At 1926 hours, the situation had intensified for the 400 series cabins, which had begun to fill up with smoke, but reports of that being under control, were fed back to the master, and confirmed by the 1/E who stated that there was only smoke and no signs of fire in the garage area beneath these cabins." (Note: the 400 series cabins are evidently located above the car deck and the water spray system there. The deck is insulated to A-60 standard and it is unlikely that anything happens above that boundary. Smoke in passenger/crew cabins? What was burning there?). ... "The location of the fire was identified by the 2/O (i.e. a deck officer!) at the forward port side of the ship in a trailer containing luggage at about 1936 hours." ... "The 2/O informed the bridge at 1938 hours, that there was an increasing level of water in the car deck." (Note: it is very strange that the water did not escape through the 26 scuppers! What could have blocked them? We don't know! And what about the fire? Why wasn't it extinguished? Anyway, there are no means to pump any water from the car deck above water line. Easiest is just to clear the scuppers! They cannot be blocked! Any garbage is floating on top of the water). "At approximately at 1939 hours, consideration was given to start coordinating the pumping of water out of the car deck (sic). The 3/O (another deck officer - should be an engineer from the ER) had reported that the pumps were in operation, but the discharged water was accumulating on the starboard side due to the fact that the water taken from the starboard side was pumped to the port side and because of the list, the water was returning back to the starboard side. ... "At this stage the list was of approximately 5 to 7 degrees to starboard. The fire was never extinguished and it expanded to several places and decks. The crew was confused while the fire appeared in different zones. The fire was fought by the crew for approximately 4.5 hours and the use of water to extinguish the fire was never successful." ... "At 1940 hours, the master asked to use a portable pump to discharge the water from the car deck." (Note: evidently you do not use (portable) pumps to evacuate water from a heeling superstructure deck high above waterline that is normally emptied by scuppers. Much easier is just to clean the scuppers. Here the VDR data becomes stranger and stranger). ... "At 1941 hours, a communication between the 1/E, R/O and master revealed that the 1/E recommended to open the 2 pilot doors to drain the water from the car deck, the master accepted the suggestion but the R/O advised the master not to open the pilot door because it may ventilate and increase the fire." (Note: much easier is just to clean the scuppers ... or open the ramp aft. All water must have flowed aft, as the ship was trimming on stern all the time. And the R/O telling the Master not to open the pilot door ... sounds very strange. And 1/E? There was no communication with the ER). Disregarding the missing cars/trucks and the smoke it may have looked something like this in the M/S Al Salam Boccaccio 98 car deck midship, when water was noted trapped and not flowing out on the starboard side. On the other, port side of the ship there was no water! ... At 2104 hours, the master discussed with the C/O if they could stop spraying the car- deck because the list had increased to approximately 7 degrees to starboard. (Note: So after 83 minutes the fire is still not extinguished and there is about 200 tons of water on one side of the car deck to heel ship 7°. But what about the trim? Had it increased ... on the stern?. All sounds strange ... untrue. And are all scuppers blocked?). ... Between 2141 hours to 2227 hours, the list further increased to 11 degrees to starboard. Meanwhile, confusion in fighting the fire was still taking place in several areas. (Note: So vessel continued the heel 4° more during 46 minutes and the passengers were happy! You need about 300 tons of water on the side of the car deck to heel 11°. But what about the trim? Didn't the water accumulate aft? The VDR data is stranger all the time). ... At 2227.47 hours the list was reported by the 3/O to have further increased to 15º to starboard. ... According to the interviews, it was clear that the scuppers were blocked due to garbage generated during the fire-fighting operation and the movement of water containing these residuals. (Note: this is very strange! Scuppers blocked due to 'garbage'!?! The 'garbage' should float on top of the water above and could not block the scuppers below. Only way to block a scupper was to put a steel plate above it. I wonder what clown invented this strange story of scuppers blocked by 'garbage'? Tom Allan?). "The list was now 25 degrees to starboard and someone asked the master, around 2330.28 hours, if they should send the "May-Day" distress signal, and the master's reply was: "send a may day send may day"
... "The ship sank at 2333 hours." (Note: an intact, floating ship with too much water loaded in the superstructure should capsize and float upside down. It cannot sink). ... "The fire was never extinguished and it expanded to several places and decks. The crew was confused while the fire appeared in different zones." (Note: There is no evidence of any fire in the passenger accommodation above the car deck or in any places below the car deck at any time. The comment is strange. And with >600 tons of free water sloshing around on the car deck causing 25° list, no fire could continue there. The report does not sound convincing. And what about mustering passengers, perparing lifeboats, calling the head office, calling Safaga, calling ships in the vicinity???). ... "During the last minutes (the passengers) started looking for options to evacuate the vessel on their own, and most of them moved to the starboard side, where some crew members were fighting the fire. At the critical moment of sinking, as they indicated during the interviews, they started walking over the shell plating of the ship on the port side, to ultimately jump into the sea and start swimming, searching and trying to reach the un-opened life rafts, which were scattered randomly in the water." (Note: You wonder how anybody can write this nonsense in an accident investigation report. It is pitch dark and passengers try to reach un-opened life rafts .... The report is a joke). Analysis - can Water loaded inside a Superstructure sink an intact Ship floating on an intact Hull? It is very easy to analyze what happens, when free water is loaded inside a superstructure of a ship floating on an intact hull. It is an intact stability problem. You just have to establish where the volume/weight of free water is located, i.e. where it flows, where its centre of gravity is and how it affects (i) draught, (ii) trim, (iii) total centre of gravity, (iv) the righting arm, GZ, and thus (v) stability of the ship. As the hull is intact, the hydrostatic particulars do not change. It is not a damaged hull stability problem, where parts of the hull are up-flooded reducing buoyancy, etc. Water sprayed on a car deck in a weathertight superstructure is just extra weight loaded that will normally flow out through the most adjacent scupper. If the water cannot flow out, it will trim and heel the ship and flow to the lowest point on the deck, i.e. in the port or starboard side and in the aft or forward corner and build up there. At the same time the ship heels more to port or starboard or trims more forward or aft. There is no risk that the ship will sink! Say that 300 tons or m3 of water was loaded on the car deck of M/S AL SALAM BOCCACCIO 98. What happens? If the water ends up at the starboard side, the ship heels about 11° to starboard. If the water flows aft, the ship trims about 1 meter on the stern. The mean draught increases about 0.12 meter. If another 300 tons were loaded, total 600 tons, the ship heels about 22° and trims about 2 meters on the stern. The mean draught increases another 0.12 meter. And if another 300 tons were loaded, total 900 tons, the ship heels about 35° and trims about 3 meters on the stern. The draught increases another 0.12 meter. Etc. But the ship still floats! And is stable! Imagine, loading 900 tons of water in the superstructucture and nobody notices, if the ship trims! The centre of gravity of the wedge of water is aft of midship on starboard side so the vessel trims on stern and heels to starboard. As the vessel apparently was rolling and pitching, the 900 tons maybe flowed forward and the ship listed 35° to port and then the forward draght would increase 2 meters, etc. No fire could possibly continue in the car deck. All cars and trucks must have been smashed by the water flowing forward and aft. The noise must have been enormous. And nobody could enter the superstructure. Every Master knows the above and no Master ever tries to ballast (fill tanks on double bottom) to compensate for free water loaded in a weathertight superstructure. Only stupid people ashore invents stories like that! It looks dramatic but the ship with intact hull is still floating with a 35° starboard heel and 3 meters trim on stern and you only have to open the aft ramp a little and all water flows out and the heel becomes 0° and the stern trim 0 meter. 900 tons of water on the inside of a superstructure is much more than on this sketch. And it will also flow forward and aft ... but not on Al Salam Boccaccio 98! It cannot sink. 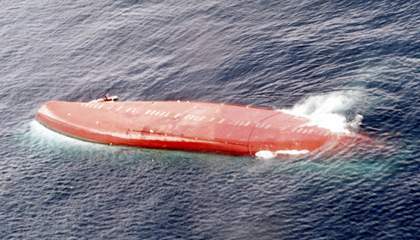 A ropax ferry that capsizes due to internal loads being added/shifted in, e.g. the weathertight superstructure, always floats upside down after capsize! Anybody suggesting that a ship sinks (and does not trim), if you load water into its weathertight superstructure via, e.g. a fire extinguishing system, is incompetent! Unfortunately, Mr. Tom Allan of IMO/MSC and director of Safety at Sea, Ltd, Glasgow, thought that M/S AL SALAM BOCCACCIO 98 sank like that and he is thus incompetent. It is really a pity that incompetent people of IMO/MSC are allowed to decide about safety at sea. It was quite easy to check the sister ships at the time full scale and do some correct, intact stability calculations what happens when water is loaded on a ropax car deck to establish that a ship does not sink due to water accumulated inside an intact superstructure. But it was not done by Tom Allan & Co. They were busy covering up the M/S Estonia accident 1994 with some fake video animations 2007! Really sad! Personally I do not believe there were any blocked scuppers or any large amount of water on M/S AL SALAM BOCCACCIO 98 car deck at all due to fire. Maybe there were 20 tons of water ... that flowed out! So why did M/S AL SALAM BOCCACCIO 98 sink? And who is responsible, if anybody? We do not know today why the vessel sank! Survivors testified that they heard explosions going off just prior the capsize and when they jumped into water and explosions can be heard on the VDR just prior capsize. Maybe the explosions damaged the watertight hull below waterline, so it sank? It seems the only answer! The fire four hours previous and water loaded via the spray system? It could not possibly have sunk the ship! Only a proper accident investigation can provide the answer. An investigation suggesting that blocked scuppers and 900 tons of water from a fire extinguishing system sank an intact ship forgetting about trim while not explaining the complete radio and communiccation silence, is not serious. It is a joke! The Panamanian accident investigation report - the joke - evidently didn't accuse the president, MI, of the company managing the ship, El Salam Maritime Transport Co, having caused the accident - fire/blocked scuppers. Everybody, including Egyptian maritime authorities and underwriters, agree that the ship was in very good, sea worthy condition and well run by that company. It was an accident - not explained - that the ship sank and >1 000 persons died. The Master lost control of the situation, when the scuppers were blocked (which I do not believe). And the Master forgot to open the aft ramp so all water could have flowed out! Strange to say the least! Unfortunately Egyptian legal courts had a different opinion. Egypt was at the time a military dictatorship and no democracy with a free press, etc. The president and some directors of El Salam Maritime Transport Co., all shore based friends of mine at Cairo, were sentenced to seven years in prison for not having alerted the Egyptian (military) coast guard at the time, so passengers and crew could be salvaged after the sinking by the Coast Guard. On appeal the directors were later found not guilty but the president's sentence was not changed - seven years in prison. One result is that the company stopped managing passenger ships ... and that no other company stepped in to carry on the traffic. I lost my job as a consultant to the shipping company. The loser is Egypt. It is not easy to run a ship management company. Particularly not in Egypt. Luckily I was just a consultant and long time friend to the president of the El Salam Maritime Transport company since 1980 and we are still good friends and hopefully the Egyptian legal court will change its mind sometime in the future about the sentenced president. Until then nobody in Egypt will operate passenger ships. Personally I believe the vessel sank due to sabotage. Comments are always welcome to anders.bjorkman@wanadoo.fr.